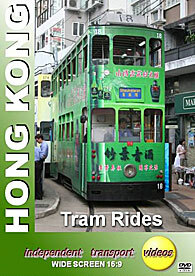 The stately double deck trams on Hong Kong Island have been plying their trade for 108 years in 2012. There have been a number of subtle design changes in their overall appearance over the years, that may not be apparent to the casual observer. Car 120 has been kept to look like it did in the early 1950’s, while the rest of the fleet were rebuilt in the 1980’s. A project that started in 2010 will see all of the trams in the fleet receiving new aluminium bodies on their existing refurbished chassis incorporating new seats, windows, doors and the latest GPS equipment for announcing the stops and electronic destination displays. In general they still look much the same – and these improvements are welcomed by the many thousands of passengers that use the trams every day of the year. The principal route is from Kennedy Town in the west along the north coast to Shau Kei Wan in the east, with a spur off to the famous horse racing venue at Happy Valley. It is a fascinating route, especially for the transport enthusiast, as it passes through the busy streets of Central and Wan Chai which are crammed with buses, trams and other traffic. The independent transport videos cameras went on board a number of trams along the entire route to bring you this fascinating programme, filmed on Sunday 16th December 2012, a quieter day! Most types of trams were seen, many adorned in colourful advertising liveries, as well as a number of the ‘new’ trams sporting the features mentioned above. Look out for car 120 that also appears. Our filming starts in the early morning at Central on board car 86 for the journey to Kennedy Town terminus. Here we board ‘new’ car 36 for a run back to Central where we film the tram action. From here we join car 40 for the long journey to Shau Kei Wan travelling through the busy streets of Causeway Bay, Tin Hau and North Point to the terminus where the trams turn on a loop at Shau Kei Wan. After recording the action we jump on board car 18 to Happy Valley. There is lots to see along the way as the tram plies its way along the reserved track in the middle of the busy streets. After filming at Happy Valley, we get the drivers eye view as we return to Central on board car 163. Our programme starts and finishes with views of the famous Star Ferry, a company which once operated the trams! Enjoy your ride!